A Big Brother fan cruise looks like it’s turning into a Titanic disaster with Swaggy C, Fessy, and the other Hive crew on board. Some are comparing the event to the failed Fyre Festival. If so, this is the second BB fan event in recent weeks that made headlines for being less than promised. The other was the basketball game to benefit Kevin Schlehuber, but then did not wind up helping him. This cruise claimed to include former winning houseguests Andy Herren (season 15) and Josh Martinez (season 19). Although both names were dropped to promote the event, neither are going. Instead, the cast members featured on the cruise seem to be Hive members from BB20. Most notably Swaggy C who was just lambasted over the basketball benefit. Is this turning out to be the latest false advertised disaster similar to the infamous Fyre Festival? Season 15 Big Brother winner Andy Herren was one of the original houseguests promised in now-deleted advertisements for the cruise. The “Out Of The House” cruise is being put on by a company called All In-clusive Travels. Andy tweeted that he had been talking to the company about participating. But then he never got needed information. With the event coming up soon, Andy Herren contacted the travel agency to see what was going on. According to the texts that BB15 Andy sent, the original person planning the cruise, messed up big time. Another rep apologized to Andy for not being able to afford to any more featured guests. The bottom line is that it sounds like they decided to pay BB20 Hive members rather than someone that won Big Brother. Yet it sounds like they didn’t contact Andy to let him know they decided not to use him for the “Out of The House Cruise”. Contrary to what has been advertised and circulating on Big Brother social media, Josh Martinez will also not be on the trip. In fact, it doesn’t seem like he knew a thing about the event. So, the BB19 winner took to Twitter to address fans who might have paid for a cruise he would not be on. Josh Martinez not only did not know why his name was attached to the event, but confirmed that “I’m not going”. The original planner of the event, Jarrod Cooper, said that he was making no money on the cruise and that he was paying out of pocket. After, he claimed that the low budget meant he had to cut some former houseguests from the roster. He also said that the deciding factor was the fan base which wanted Hive members. Josh it seems, was never in the mix despite word that he was. For everyone asking me if I’m going on a bb cruise don’t know why they attached my name to that list but it’s not true. And I won’t be going. You can see below on the left a glimpse of the giant roster of ex-Big Brother winners and guests promised. 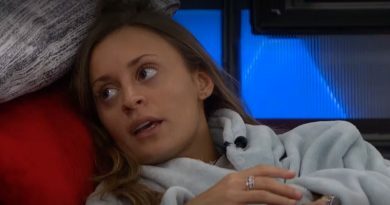 You can see they promised four US BB winners, one BB CAN winner, and other houseguests. Plus, the ad teased more would be added. Instead, you can see from the final list from the travel agency’s Facebook page, it dropped from 14+ down to five. None of them are winners. Not even any runner’s up. 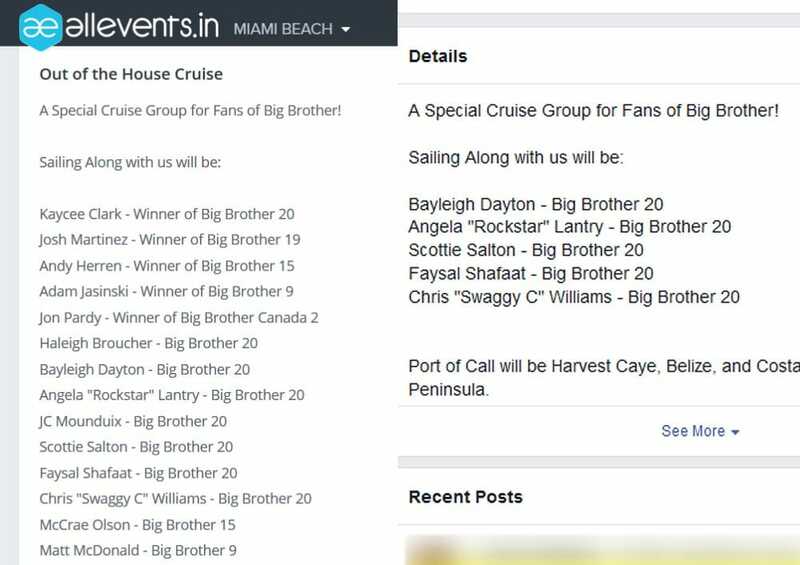 It also seems that this won’t be an entire cruise devoted to Big Brother. It looks more like some meet and greets on a standard cruise. Will Swaggy C Have to Answer to Controversy on the Cruise? This situation begs the question of whether any Big Brother fans on the cruise will ask Swaggy C to explain where the money went from the cancer fundraiser. There are still details coming to light directly after the controversy surrounding the fundraiser. He claimed a portion of the proceeds would go to Kevin Schlehuber, who is recovering from prostate cancer. 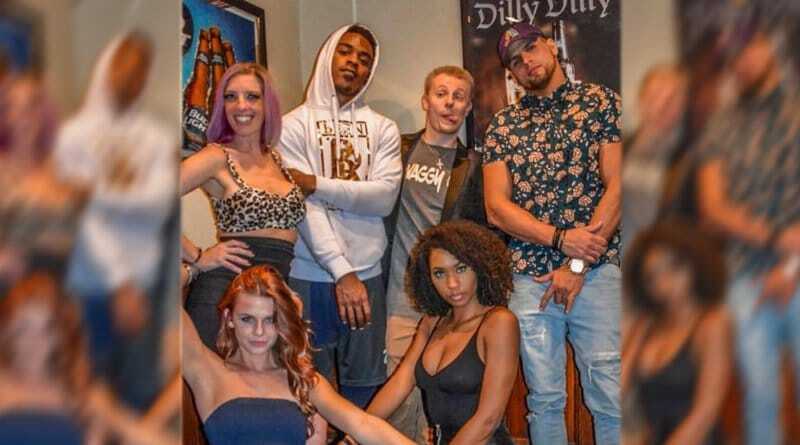 Long story short, Swaggy C split most of the money between himself and Fessy. The latter apologized for his part in the money distribution that saw him and Swaggy each get $2k, and Kevin only $800. Then, Swaggy posted a YouTube video that is now deleted about his side of the story but only seemed to dig himself a deeper hole. Is this boat ride also going to be a train wreck? It sounds like the planning might have been as bad as for the hoops fundraiser. After the light was shed on the shady going on around the Big Brother “Out of the House” cruise, fans compared it to the Fyre Festival. If you missed those headlines, the Fyre Festival was supposed to be an exclusive music festival for the elite. But it crashed and failed miserably. Luxury accommodations were instead FEMA tents. Gourmet meals were inedible and cheap cheese sandwiches. The Fyre Fest was so crazy behind the scenes, Netflix and Hulu both released documentaries about it. People who already paid for this Big Brother cruise requested their money back. Others voiced concerns on the travel agency’s FB page but aren’t demanding refunds yet. The travel group blocked its critics. That’s exactly what the Fyre Festival did leading up to its much-lambasted event. As of now, the “Out of the House” cruise will be headlined by Chris “Swaggy C” Williams, Bayleigh Dayton, Faysal “Fessy” Shafaat, Angela “Rockstar” Landry, and Scottie Salton. This comes just days after the drama with Swaggy over the now-tainted fundraiser. 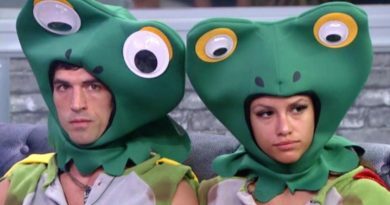 The Hive is considered by many Big Brother fans to be the worst alliance of any season. If you want to go hang with Swaggy C and the Hive, the event runs February 24 through March 1 on Norwegian Cruise Lines out of Miami, Florida. Make sure to follow Soap Dirt for the most up-to-date Big Brother news!